Time for a pic. Here’s a distinguished member of the local wildlife scene, a male cardinal. 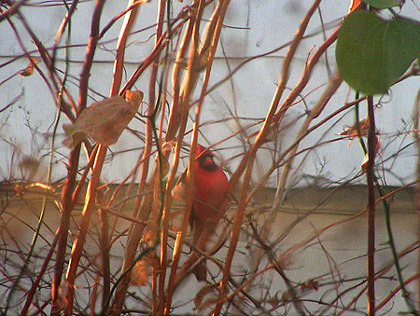 He’s just hanging around in the bushes, awaiting an early sunset in December. It looks as if he’s filled his belly for the day and is just taking in the scene. In a few minutes he will be heading back to the nest for the night with his mate. The cardinal brings up some interesting questions about the process of evolution. The male cardinal evolved it’s delightfully colorful plumage so as to better attract females for mating. The red color gave some members of the early cardinal species a reproduction advantage, so the color was "selected" into the male genes. But once the process was completed and every male cardinal was red, was the overall cardinal species any better off? Arguably it was worse off; the female retains its camouflage brown, but the males became sitting ducks for those animals that attack birds for a living. And yet, despite this evolutionary dead-end, the cardinals somehow survived, and lived on to delight us humans (especially on those drab winter days when everything is all brown and gray). Now I’m as Darwinian as any legitimate scientist. I don’t like those “intelligent design” theories that the Bible-thumping creationists are trying to sneak into the school curricula. I think that those folk should go find better ways to save souls and spread the word of salvation than to corrupt our scientific and educational institutions (like maybe helping the poor and the needy). I know that there's a good scientific reason that explains why red cardinals still get by in certain environments. BUT. I do have to wonder if there is a deeper layer of reality behind what physics studies, a layer that does allow for things such as beauty and virtue (you know, the Kantian categorical imperatives and such). And also the mental consciousness that allows us to appreciate those things. Perhaps the little evolutionary dead-end that gave our world the cardinal’s beautiful plumage, and the consciousness to enjoy it, are reflections of something more than our science can now (or should now) attest to. What a beautiful picture! I love it. The bird all plumped up and staying warm with his feathers keeping in his heat. The other day someone told me she saw a robin outside her window--the same: all plumped up, looking very "fat." And I agree with you. There are some things that science just is not the appropriate place to go to find answers. The Cardinal is one. Sometimes I wonder if creators (ultimately I wonder if we ourselves are not creators)who may be in the "next world" have practiced on such things. Let me see: "Today I'd like to make something beautiful. Let me see if I can figure out how to arrange this bird's evolution to come out to a beautiful red color. I always liked a beautiful red color." And it fits in with my idea that it's possible we ourselves might be creators; after all, don't we create who we become? Yes, my "Cardinal thought" may be a stupid thought; but sometimes I wonder if it might not just be the right thought. If God (himself/herself) doesn't have time for the "little" beauties of life, perhaps he delegates the work to someone else. In effect "saying," "See what you can do to make something beautiful today." So, maybe these things are creations of a lesser god--but one who really enjoyed/enjoys beauty. Who is to say I might not possibly be correct? Well, it's my thought anyway. And your picture is absolutely beautiful. I find myself today thinking of your lovely Cardinal. We have a miserable day here in the Midwest of freezing rain, plain rain, snow, etc. I see no birds out at all--obviously. I think of where I lived before I moved where I am now. We had a "balcony" outside our upstairs bedroom door to the outside. We could see the under side of this "balcony" from one of the downstairs windows. In the very cold weather or other such types of miserable weather, several sparrows would roost on the inside "I-beams" that supported the balcony. The sparrows were out of the wind, out of the rain, snow, etc. They would fluff themselves up and would sit there so still I'd wonder if they were alive or frozen. At one time I went out under the balcony. I could almost see the sparrows "thinking": I don't see you there; please don't disturb me; even though I notice you see me, I'm pretending I don't see you. They had found a place to shelter for themselves. I'd leave them there and in turn pretend I didn't see them so that they would feel unafraid and stay there. I'm sure your cardinal has found/will find a place of shelter if/when you get this miserable weather we have today.